OK so its that time again. I’m hoping and praying that this is the last one for a long time. I am flying out tomorrow morning for Los Angeles, California. My flight leaves at 10:45AM and I’ve got a layover in Dallas then from there to L.A. We should be landing in LAX by 2:30ish. But sometimes things change so I don’t know exactly whats the plan for that. The interview is on Wednesday at 11:00AM. I’m not nervous for the interview per se. But I’m nervous about the whole trip in general. I’ve always wanted to go to L.A., I always pictured it would be different than this though haha. Well at least I’m going to get to chill with some friends to relax before I go to the interview. So that will be good. I’ve got a full day to relax and explore to an extent I suppose before the interview. I don’t really have a whole lot to say tonight. Once again I’m here typing instead of packing like I should be, but I wanted to do a short blog before I left. If I have internet available to me when I get out there I’ll update about the interview if possible, otherwise ya’ll can expect a big update when I return. Keep me in your thoughts and prayers this Wednesday. Thanks everyone. I’ll leave you with this. I was reminded of it the other day and I found it fitting. So I’ve been needing to do this for awhile. But I was waiting on my most kind photographer to upload some pictures after he was done with his editing. About 2 weeks ago I finished building the bike. I put about 80 miles on it roughly 128 Kilometers in a week. Then when it was time to return home after hanging out with my brother and his roommate (Anthony) and our friend Tommy for a week, I was discussing how I was sad that the bike was so awesome but I was gonna have to sell it eventually because I wasn’t going to be able to bring it with me to Japan. However I’d be able to use the money to buy a new camera for Japan and that would be awesome. So Anthony had posted a picture of the bike and had mentioned that I might be selling it. And that night someone said they wanted it and was willing to pay exactly what I was asking for it. So yea. SOLD. Unfortunately I won’t be able to buy that camera yet though because I have to fly to Los Angeles now on the 30th for an interview for Japan. And thats more important so the bike is paying my plane ticket and food expenses. I can’t complain too much about that though I suppose. If I come across any more cool bike info I’ll be sure to post it up otherwise my next cog blog is probably going to be in regards to my next build when I get to Japan. I promise it will be way more awesome than this one if you’re into that stuff. Anyway here is a quick bike check as its pictured. running an Origin 8 17t cog and 46t chainring. Not pictured was a Black premium pivotal seatpost and Resist Icon pivotal seat in black that I never got to put on because I sold it before it came in. I’ll just put them on the next bike. Anyway here is the pics that Bobby took. He’s a fantastic photographer and getting better all the time. So living with my grandparents I seem to be revisiting alot of memories from my childhood. One of which I’m sharing with you now. Popping corn. Now the reason I say it that way instead of pop-corn is because we actually go through the steps of making it instead of just taking a bag out and putting it in the microwave. This process is a little different then the process from when I was a kid because when I was a kid there was an electronic popper that didn’t involve the microwave at all. Back then we used popcorn oil or peanut oil usually. And it had a little metal stirring rod that would stir the kernels in the oil after they were hot so they would pop instead of burn. If we really wanted to be old school and it was winter, my grandmother also had a cast-iron pot that we would put in the fireplace that was made for popping corn as well. That was interesting. But didn’t work as well as the aforementioned device. Now what you see pictured here is a little different. There is a bowl with a paper tray in the bottom. in the tray is the kernels and COCONUT OIL. Then its put in the microwave for 2 1/2 minutes. After that you put the butter on it. 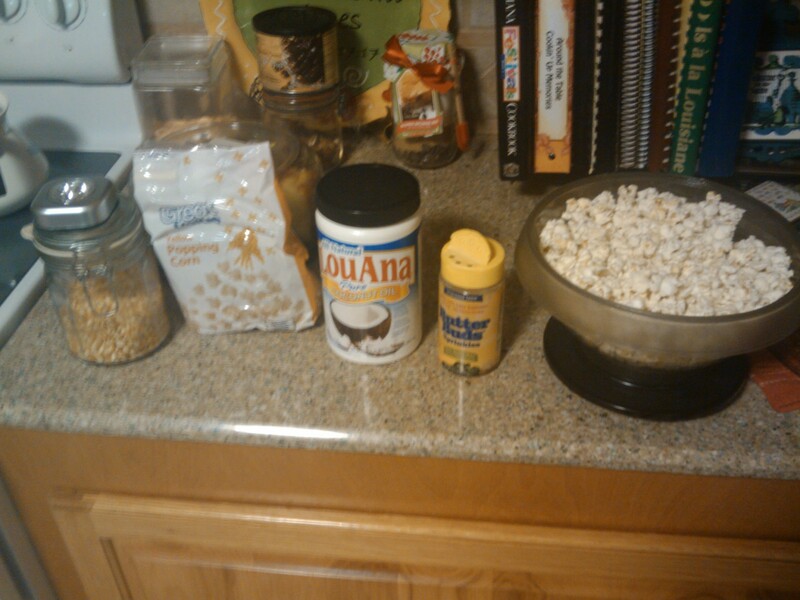 Now what is not pictured is the popcorn salt. My grandmother said it wasn’t necessary I said it definitely was. Now the whole reason we ended up doing this is because I saw the container of coconut oil and asked what it was for. I thought it was odd. Apparently my grandmother has moved to that instead of peanut or olive oil because it is supposed to be the healthiest. Interesting stuff, regardless this pop-corn is fantastic. Just thought I’d share this. Just got back into Eunice. I’ve been in Lafayette for the last week. I went to spend some time with my friends and brother there. I brought my bike along and rebuilt it with all the new parts. Then ended up selling it less than a week after I finally had everything on it. But I’ll post more on that later. So I mentioned in my previous post that I had gotten a call from one of the jobs I had applied to. Well while I was in Lafayette I got the email back saying that they want me to come for the personal interview on February 1st. So I’m going to fly out to Los Angeles on Jan 30th probably. I’m going to buy my tickets tomorrow. But I’ve still got a few things to get together before I head out there. I need to get a couple of letters of recommendation and a copy of my passport. So I’ve scheduled the interview on the 1st to allow me time to get the letters of recommendation together before then. I’ve always wanted to travel to Los Angeles and now I’ll finally get the chance. Tickets aren’t too pricey. They are more than I’d like them to be. But I’m hoping that I’ll be able to chill with some friends out there who I’ve met through the JZXProject, which will hopefully save me some money on a hotel. Anyway just wanted to update on that. I’ll probably do another video blog here pretty soon. I was woken up from a nap today by a interviewer for one of the jobs I had applied to back in November. We had a short phone interview about 25 minutes. And everything went pretty well. She said she would email me and the next step if we decided to take it would be to go to Los Angeles for a personal interview….well I don’t know if I really want to do all that but I do really want a job, and I have always wanted to go to Los Angeles. Now of course this wasn’t one of my first choices. But this isn’t the worst by any means. I believe this would be a cool company to work for. Unfortunately its one where I have no idea on placement at all. And I don’t think I would know until after an interview and I’d be given a position. But within the company there is opportunity for movement and advancement. Anyway just thought I’d update about that. Here begins my biking chronicles. I’m going to have this section and another one for cars as well. People were asking about wether I would talk about the cars I saw in Japan. And of course I would. But since cycling seems to be becoming such a large facet of life I thought I should add it as well. This weekend I’m going to Lafayette to rework my bike. This week I managed to bend my rear wheel so now it waves at everyone when I ride. However I have a new wheelset waiting to go on. So I suppose that its not that big of a deal. The new wheelset is triple walled so the chances of me bending them is pretty slim. See originally the bike started like this. Then I added a few parts. 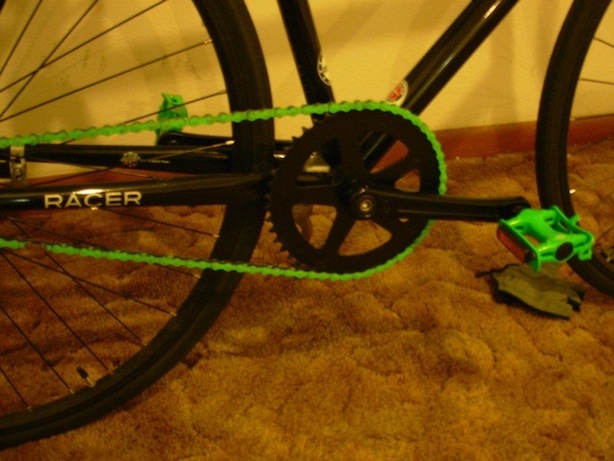 Then I added some green track pedals. At this point I thought I was done. I was planning to sell the bike because I’m moving to Japan so I wasn’t going to do any more work to it. But because its a Racer it has a coaster brake. 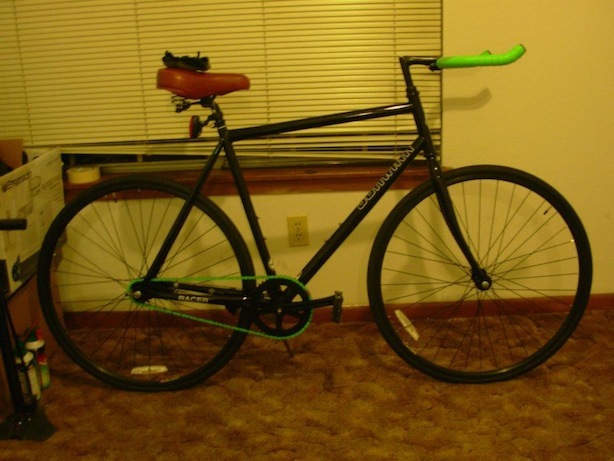 I’m planning that the bike I build in Japan will be fixed gear. So after riding for a few months and really enjoying it. My friends and even my brother has decided that they also are picking up riding as well. For fun and fitness. Well they both picked up bikes that can flip flop fixed/free. After riding their bikes and seeing that fixed gear isn’t hard to ride at all. Infact its quite easy. I thought It was finally time to buy a fixed wheelset. And start practicing. That way when I build a bike in Japan I won’t just kill myself trying to ride for the first time there. So I’m going to be riding even more trying to get good at it while I’m here for the next couple of months and sell my bike to help fund the trip. I’ll try to post up some pictures of the changes this weekend. Its gonna be pretty drastic. A little change in color scheme but not much over all. And a change in bars yet again. And maybe some pictures of riding around lafayette. Also I’m going see Premium Rush next weekend. The Fast and Furious of bike movies. HAHA. So here we are Jan 05 2012. I’ve applied to two more jobs. As I browse the job boards it seems as the the wellspring is drying up. I’m applying to jobs in all areas. I’m not picky. Except for one that I passed on because it was so near to the Fukushima area. Sorry I want to go to Japan bad, but not that bad. So jobs require experience in Japan teaching already. I don’t have that. I’ve seen two that was looking for people who were already living in Osaka. I suppose at the moment there isn’t much that I can do about that. I can take the plunge and head out. But when. When do you do it? When do you say ok now is the time when I know that I can do it. Now is the perfect time to go and apply with hopes that I will find something and that this won’t just be a really expensive vacation. Where? Where do you go? Tokyo? Osaka? Nagoya? Hiroshima? Fukuoka? Okayama? There are some niche market areas. Like Okayama, or Gifu or Mie, but I think the larger cities offer the better chance. I don’t know. But I’m not just sitting here. I am applying; I am trying. I’ll probably do another video blog soon. With more ENGERGY! HAHA. Good things coming soon though. I’ve got a couple of expansions for the blog as well. One for bikes both here and in Japan. When I see them when I ride them and when I explore on them. And one for cars. Since most of you will want to see the cars that I’ll be looking at or gawking over in Japan. But I probably won’t start that until I get there. Unless I do a quick blog on the Hopeless Romantics here before I leave. Anyway. I’ll leave you with a song since I haven’t done that in a bit.